This Memorial Plaque to the Reverend Matthew Kirkland in the Auld Kirkyard was kindly gifted by Mr. Russell Brooks of Ayrshire Memorials. It has been placed at the far wall between the headstones of the Reverend William Reid and Reverend Robert Murray. Matthew Kirkland was born in Carmunnock, Glasgow in 1800 and was presented to New Cumnock parish by John Marquess of Bute in September 1835 and ordained in December that year. The original parish church, built in 1659, could no longer meet the demands of the growing population and the foundation stone of new parish church was laid in 1831 and the congregation met there for the first time on 23rd May 1833. The following year in 1839 at Glasgow he married Anna Smith, daughter of the late John Smith, hosier and together they had a daughter Isabella Donaldson born on 27th February 1841, in the manse at New Cumnock. Within a few years the Kirkland family were looking for a new home. In 1843 a great schism in the Established Church, known as The Disruption, resulted in over 400 ministers, including Matthew Kirkland, seceding from that church and forming the Free Church of Scotland – a church free from civil interference. Many of the Matthew Kirkland’s congregation followed their minister and left the parish church some 10 years after it had opened its doors. The Reverend Kirkland now delivered his sermons from the window at the Castle close (Castle Inn). However very soon a Free Church and manse along with a Free Church School and a school-house stood on the castle hill, on the site of Cumnock Castle and adjacent to the ruins of the Auld Kirk, the original parish church. The memorial stone for the Free Church was laid on 29th August, 1843. 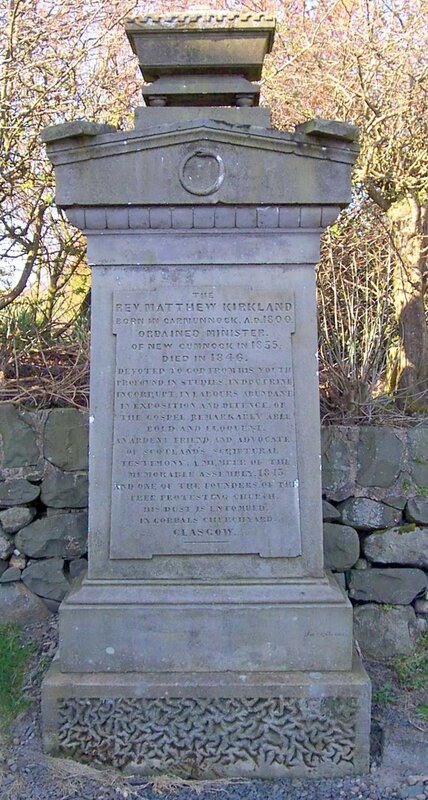 Sadly three years later in the summer of 1846 the Reverend Matthew Kirkland passed away, aged 46 years old. He laid to rest in the Gorbals churchyard in his home city. The New Cumnock congregation erected a memorial stone to their minister in the church grounds. It stood there for many years long after the Free Church had been replaced by the Arthur Memorial Church but sadly mysteriously disappeared without trace. His widow Ann along with their young daughter Isabella set up home with in Rhu, Helensburgh and it was here that Ann passed away in 1872, aged 72 years old.